SHOP FARRAGUT and Town of Farragut have teamed up with Smoky Mountain Dock Dogs and Ricki’s Pet Depot to once again bring a nationally sanctioned regional canine aquatics competition of DOCK DOGS INTERNATIONAL. The festivities will take place in the Village Green Shopping Center parking lot, just south of Stein Mart and the new Planet Fitness, Friday, August 17 through Sunday, August 19. “We had over 45 dogs of every breed imaginable totaling 258 entries into each of the various competitions last year. These pets represented entries from 6 different states!” states Shop Farragut organizer, Steve Krempasky. DockDogs was established in 2000; its first event was at the ESPN 2000 Great Outdoor Games competition. This competition will attract dog owners from across the Southeast. Last year there were over 30 competitors and more than 2500 visitors at the first-time Farragut event. Registrants will be able to gain qualifying points towards attendance at the World Championships, which coincidently will be held once again in Knoxville at the Civic Center October 13 thru 19. If you have never witnessed this - expect the unexpected! First Utility District is a major sponsor supplying over 27,000 gallons of fresh Tennessee River water to fill the pool for the weekend. The festivities will start on Friday evening with a local dog “Pooch Plunge!” Local dog owners who will have the opportunity to have their ‘puppy’ try a Dock-Dive! K9 Pet Services of East Tennessee has underwritten The Plunge activity which will allow non-competitors to try the DockDog experience free of charge. Between 4 and 7pm, members of the Smoky Mountain DockDogs Club will assist area pet lovers with their introduction to the sport. “Last year, our Club helped 33 local pet owners try a DOCK DIVE. I believe that is a new benchmark for this type of event,” said Smoky Mountain Dockdogs President, Trent Steele. 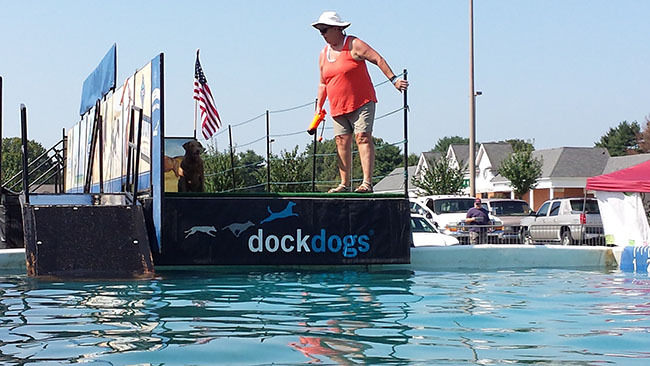 Those interested in entering their dog in the actual competition, (all breeds accepted) can email dd_admin@dockdogs.com, call the office at 330-241-4975 or go online dockdogs.com. Actual competitions will begin on Saturday at 11am. Between qualifying rounds, spectators can shop the Village Green shopping center, visit the many merchant booths on-site, mingle with pet food suppliers, plus get food & drink at the beer garden while visiting many pet related vendor booths and displays. There is NO admission to attend this exciting event. The final rounds of competition and award presentations will take place Sunday afternoon. For the eager competitors, the DOG DAZE Event Format: Outdoor Big Air®, Extreme Vertical®, Speed RetrieveTM, and Iron Dog Rankings will be in effect. DOG DAZE is made possible from support from TDS Telecom, SouthEast Bank, Costco Wholesale, Ricki’s Pet Depot, Upbeat K9, Hush Puppy’s Pet Services, K9 Center of East TN and Natural Balance.